Here it the end of April and we are looking forward to a week of rain. 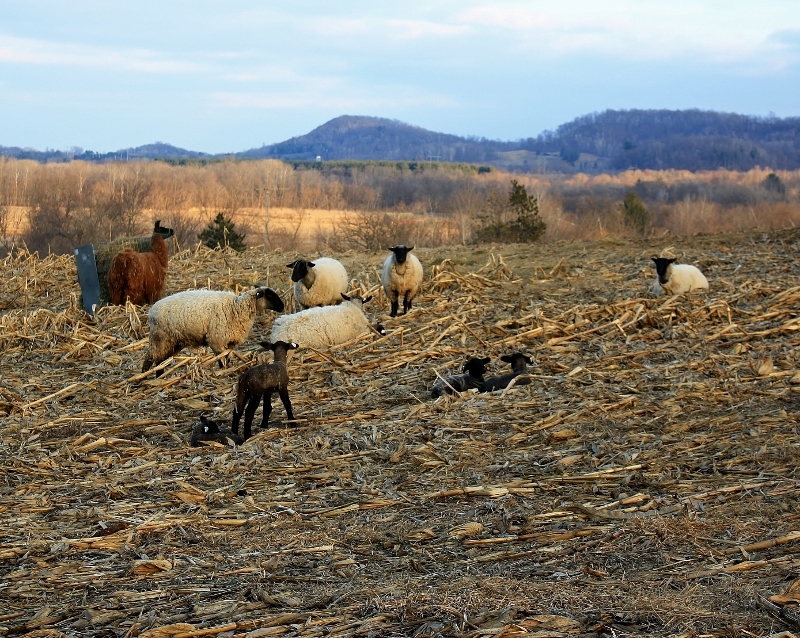 The spring time bring lambing season to Prickly Ash Hill Farm. It was a good season, but we have had better seasons and some seasons worse. With the endless cold of winter, I am glad we lambed late this year. We only bred 5 ewes last fall and held back 5 spring lambs. At one time we had dreams of lambing 20-25 ewes and this year that would have been all we could handle. The 10 head on the farm this year was more than enough. The extreme cold and endless snow falls made 10 head just about right. Last summer when I was baling hay the knotter on the baler broke. The hay was in perfect condition and it would have been a shame to wait until the knotter was fixed. I drove over to the neighbor’s and asked him if he could make small round bales for me. He said he would be over that evening as soon as he was finished wrapping hay bales for another neighbor. He asked me what size I wanted, and I told him to make them 4X4. He responded with ” The last time I made you round bales, I made them 3X4.” After talking awhile, I told him to make them 3X4. The next day I drove pass the field and it was covered with 30 “Husky Boy Bales”. That was a great decision as the winter unfolded. The 3X4 round bale is what I refer to as “Husky Boy Bales”. They take a good husky boy to push those bales around and no tractor is needed. I was able to roll them into my trailer and transport them to the pasture. I would unroll some of the bale and put the rest into a bale feeder. As the snow got deeper I wasn’t able to unroll the hay so I just put them in the feeder. When the snow got deep enough I wasn’t able to take the bales out to the pasture with my trailer. Then I went and got my Dad’s bale spear and put the spear on my tractor and took the bales out to the feeders. With the size of my tractor, a Ford 8N, a bale on the spear was enough counterbalance to pull the front wheels off the ground and leave me with no steering. I made it work this winter and kept the sheep fed all winter. The first lambs were born the end of March. 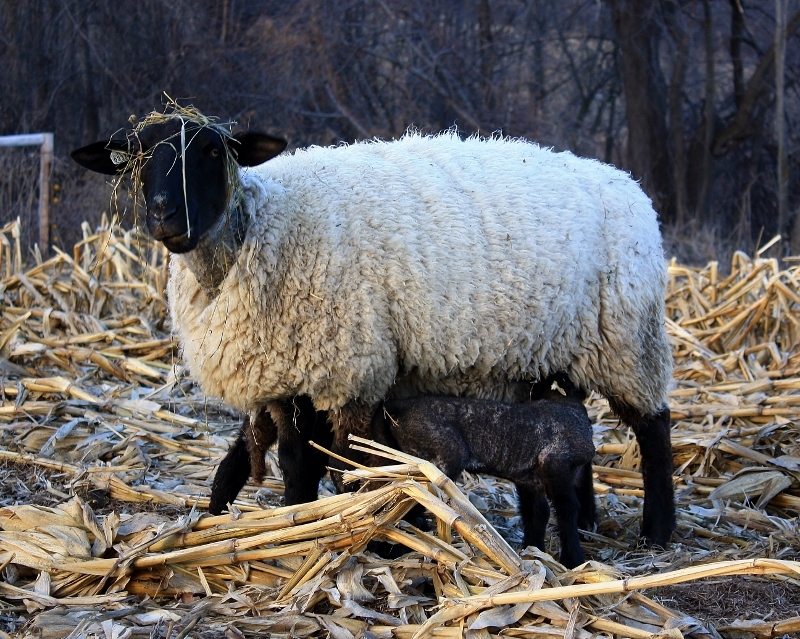 The endless cold of the winter was fading and it was a nice time to start lambing. 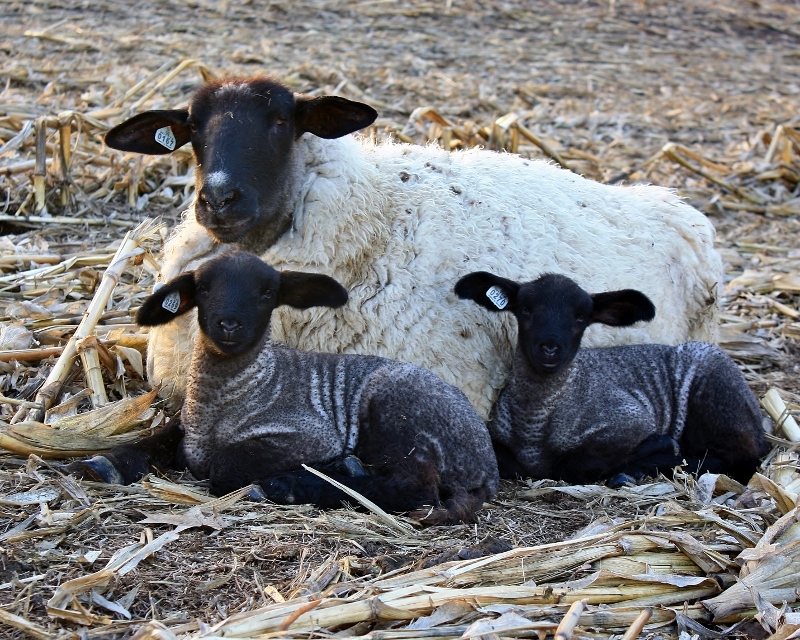 In the past when our daughter was in 4-H, we would try to have our lambs near the 15th of February so they could be shown in two different classes. Before the 15th they would be classed as a winter lamb and after the 15th a spring lamb. Lambing at that time of the year you would have to be right there to start drying of the lamb and help them start nursing. We wanted the lamb to get its first nursing within 30 minutes of being born. After they had their bellies full of milk, they were good to go no matter how cold the winter got. In late March the sun is warm and some of the snow is melted. The time frames are still important but not as critical. After the lambs are about 2-3 weeks old they start to get a good set of legs under them. They start drifting away from their mother only to find she is gone. They start to cry out and do a mad dash to find her. 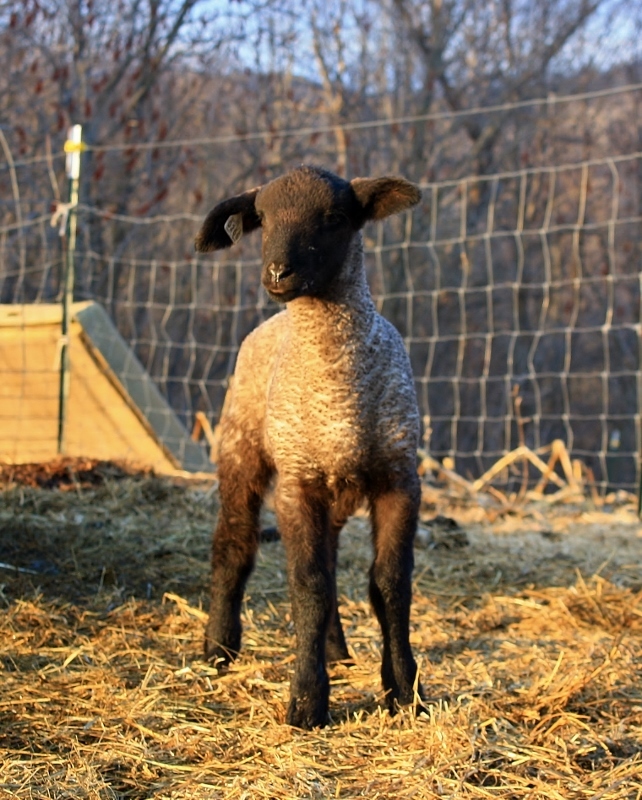 Also the lambs will start packing up and run around the pasture as a pack. As my one neighbor says “They look like little NASCAR’s racing around the track.” Our back patio door looks out over our barnyard and pasture. 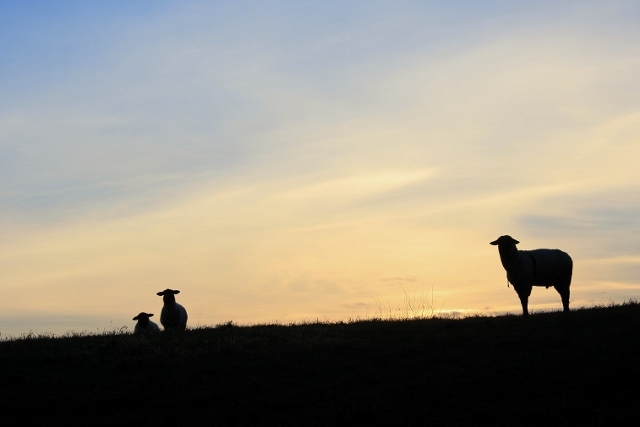 It is a peaceful time in the morning or evening just to sit and have something to sip on and watch the sheep. It is a moment in time to allow your mind and spirit to relax and take on peace from a busy world. When my grandson, Carter, comes to visit I hitch the trailer to my tractor add go out for a ride through the pastures. On our ride we will look for the sheep and see how they are doing. This summer Zach, grandson number two, will be able to join us on our rides around the farm. My farm isn’t very big, it’s only 13 acres but still offers a great time for the grandsons and time spent with Grandpa. A few years ago we were offered to buy a ’52 Ford 8n from a family member. I grew up riding on and driving Ford tractors on my Grandpa’s farm. I remember sitting on knees of my uncles taking rides around the farm. As I got older and started driving the tractor on my own I learned on my Grandpa’s Ford 800. There was only two gears I needed to know. Third and reverse. Neutral on the 800 was vertical, so with the shifter pulled up, third was a push forward and reverse was pulled back. Simple enough as a starter tractor. With the trailer in tow I would go out into the fields trapping pocket gophers. I would help Grandpa get rid of the gopher mounds coving the hay fields. With a little driving time and experience the first piece of equipment I pulled with a tractor was a Farmhand hay rake. Another simple piece of equipment for teaching a young person how to drive a tractor. The rake wheels that windrowed the hay were ground driven. No moving parts for the inexperienced driver. Just drive until the field was all raked and that could be 10 to 20 acre fields pacifying several hours of driving excitement. As I got older the tractors got bigger and the equipment more complex. My Grandpa’s biggest tractor was a Ford Commander 6000. When I sat in the seat I felt like a ruler commanding a view of my farming kingdom. Today I hitch my utility trailer to my tractor and take my grandsons out for a ride. Their rides will be different than mine were 45 years ago. My son-in-law works for John Deere in customer support and part of his job is to read all the reports on farm accidents. He reads to many reports of preventable accidents. As he states “A tractor has one seat and so there should be only one person on the tractor.” Some of the reports also describe children falling out of a cab of a tractor and being injured and killed. I respect his view on safety, his children will ride in the trailer. Memories are memories regardless where they ride. 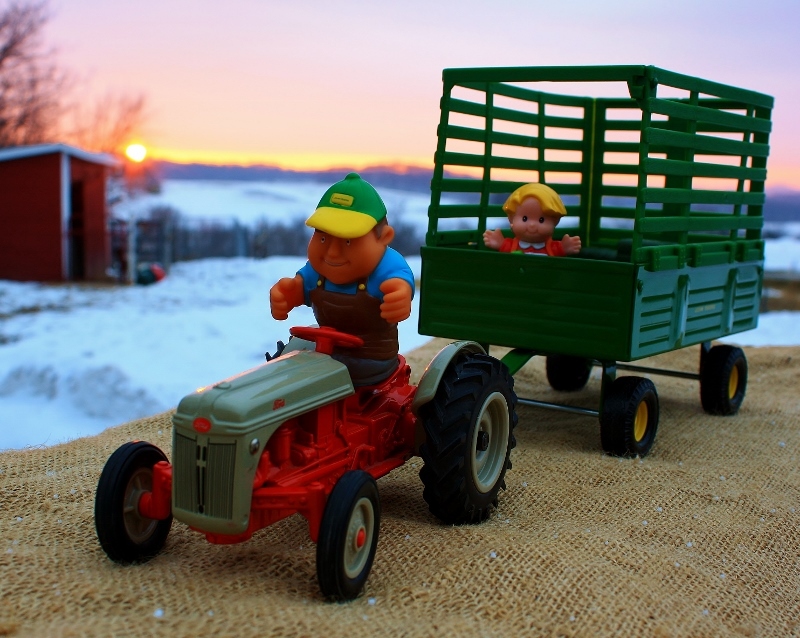 When Photo Challenge posted the challenge for week 11 I thought of Carter playing with my toys and decided to recreate his tractor ride memory. Enjoy Carter’s memory. This morning started with rain and the weather reports of in coming snow storm watch until Wednesday morning. I had a dental visit for cleaning and polishing. I headed in to town for the visit. After the cleaning the dentist gave me 6 more months of smiling. After a little shopping for tonight’s dinner, Carolyn Cares Pumpkin Chili, I headed over to Eau Claire to pick up some carpet. I thought I had a break in the rain, I’m not that lucky! I had them wrap the carpets in shrink wrap and I had brought along a trap to wrap the carpet. They made the 30 mile journey nice and dry. After I got home I did some household management chores and made the chili. As I started to think about going out to feed the sheep and chickens I looked out the window and saw the sun was coming out. I thought there might be a nice sunset so I grabbed my camera and headed out to the pasture for a photo. The camera captured a much more beautiful picture than my eye.